Replacement Fuse, 3-A for Maxim, Classic and E-Classic furnaces (excludes Dual Fuel models-use 5-A). Various Fuses and Fuse Holder protect solenoid from overload. Price per foot for door seal rope, 7/8". Silicone is not included. E-Classic replacement latch spring clips for rear panels and Reaction Chamber panel. Replacement sight gauge tube only (Per Foot, 9/16" OD x 3/8" ID). Classic Edge 350, 550 & 750 models use 6" length. E-Classic 1450, 3200 & 3250 models use 6" length. E-Classic 1400, 2300 & 2400 models use 7" length. Forge 1500 & 3500 models use 9" length. Classic 4030, 5036, 6048 & 7260 models use 9" length. Pallet Burner models use 14" length. Components replace original components. Clear tubing for the E-Classic air proving switch. 10 feet required for E-Classic models. Replacement ignitor burner gasket for E-Classic 2300 models. Reaction Chamber Firebrick, 9" x 4.5" x 1.25"
Reaction Chamber Firebrick, 4.5" x 4.5" x 1.25"
Reaction Chamber Firebrick, 6.625" x 4.5" x 1.25"
Reaction Chamber Firebrick, 9" x 4.5" x 1.25". NOTE: Replacement firebrick for E-Classic Reaction Chamber is available in different sizes. Refer to Technical Specifications for model specific quantities of firebrick installed in the Reaction Chamber. Reaction Chamber Firebrick, 4.5" x 4.5" x 1.25". NOTE: Replacement firebrick for E-Classic Reaction Chamber is available in different sizes. Refer to Technical Specifications for model specific quantities of firebrick installed in the Reaction Chamber. Reaction Chamber Firebrick, 6.625" x 4.5" x 1.25". NOTE: Replacement firebrick for E-Classic Reaction Chamber is available in different sizes. Refer to Technical Specifications for model specific quantities of firebrick installed in the Reaction Chamber. Reaction Chamber Firebrick, 4" x 4.5"
Reaction Chamber Firebrick, 4" x 4.5". NOTE: Replacement firebrick for E-Classic Reaction Chamber is available in different sizes. Refer to Technical Specifications for model specific quantities of firebrick installed in the Reaction Chamber. Short replacement turbulator for E-Classic 2300 models. Note there are three different lengths. Medium replacement turbulator for E-Classic 2300 models. Note there are three different lengths. Long replacement turbulator for E-Classic 2300 models. Note there are three different lengths. Replacement spring on these furnace models using solenoids on the primary air intake assemblies. - Classic Edge 350, 550 & 750 models with molded elbows. - Classic Edge 750 models with steel elbows. - E-Classic 3250 models with molded elbow. - E-Classic 1400, 1450, 2300, 2400 & 3200 models with steel elbows. Temperature Sensor Well for Classic model outdoor furnaces with a Digital Temperature Controller. Replacement Bypass Alarm Switch for E-Classic Ignition Ready furnaces and Classic Edge 550 and 750 furnaces. Replacement snap action door switch for E-Classic Ignition Ready/Dual Fuel models, Classic Edge 350/550/750 models and Forge 1500/3500 models. Replacement close-off plate for low secondary intake on all E-Classic models except the 1450. Protects transformer from short circuit. For E-Classic models. Drip Edge, Classic Edge 350. NOTE: When installing a replacement Front Air Channel Kit for early production Classic Edge model furnaces that have the top of the front air channel bolted to the bottom of the door frame, it is recommended to weld a drip edge. Used to clean the flue passageways of E-Classic 2300 and M175 models. Not to be used for cleaning 6" or 8" chimney. 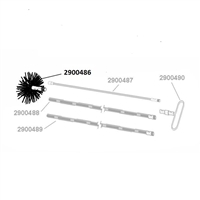 Replacement handle only for use with flue brush (part number 310) and extension rod (part number 312). Available as a kit (part number 310). Extension Rod for Flue Brush, 48"
Extension Rod only, used to clean the flue passageways of E-Classic 2300 and M175 models. Not to be used for cleaning 6" or 8" chimney. 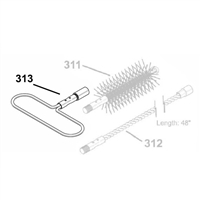 For use with handle (part number 313) and flue brush (part number 311). Available as a kit (part number 310). Note regarding shipping: This is an oversized product cannot be shipped via USPS Priority Mail. Please choose UPS Ground shipping method upon checkout. Drip Edge, Classic Edge 550. NOTE: When installing a replacement Front Air Channel Kit for early production Classic Edge model furnaces that have the top of the front air channel bolted to the bottom of the door frame, it is recommended to weld a drip edge. Drip Edge, Classic Edge 750. NOTE: When installing a replacement Front Air Channel Kit for early production Classic Edge model furnaces that have the top of the front air channel bolted to the bottom of the door frame, it is recommended to weld a drip edge. Used to clean the flue passageways of E-Classic 2300 and M175 models. Not to be used for cleaning 6" or 8" chimney. 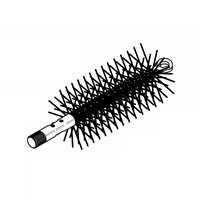 Flue Brush only for use with handle (part number 313) and extension rod (part number 312). Available as a kit (part number 310). Replacement 8" Chimney brush only. Brush is a component of Chimney Cleaning Kit (part number 2500297) for cleaning both the horizontal and vertical portions of all 8" chimneys. Note regarding shipping: This is an oversized product cannot be shipped via USPS Priority Mail. Please choose UPS Ground shipping method upon checkout. Curved Refractory only for E-Classic 2300 models. Dimensions: approximately 1.6" x 4" x 11". Also see p/n 2500055 and 2500056 for Fushion Combustor Kit. Attached to Cleaning Rod (p/n 9439) for cleaning the refractory slot. Replacement Rocker Switch, Power Supply (on-off), 5A breaker Replacement closeoff plate asm for primary intake on all E-Classic and Classic Edge models with steel elbows. Replacement closeoff plate asm for high secondary intake on all E-Classic models except the 1450.